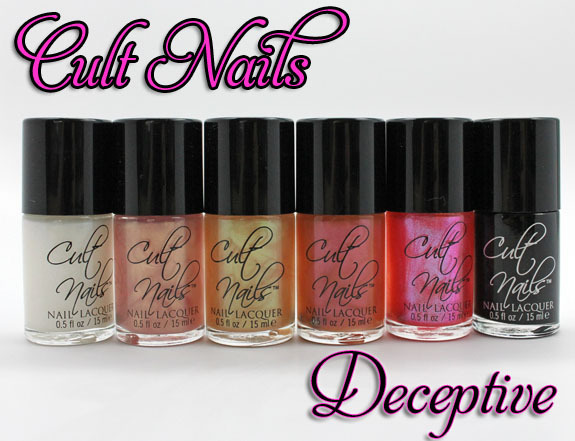 Cult Nails has a new(ish) limited edition collection out called Deceptive. Deceptive features five new color-shifting top coats. These top coats are all kind of awesome because you can get so many different looks from just one bottle, depending on the base color. For simple purposes, I showed them all over Cult Nails Nevermore, which is an excellent jet black creme (not included in the set of five). For all of these swatches I used just two coats of Nevermore and one coat of the top coat. Doppelganger is a multi-colored shimmer featuring mainly green, pink, blue and purple shimmer. Over a black you see a lot of green. Alter Ego is an old gold/green top coat. Over a black it looks like a gorgeous olive green shade. 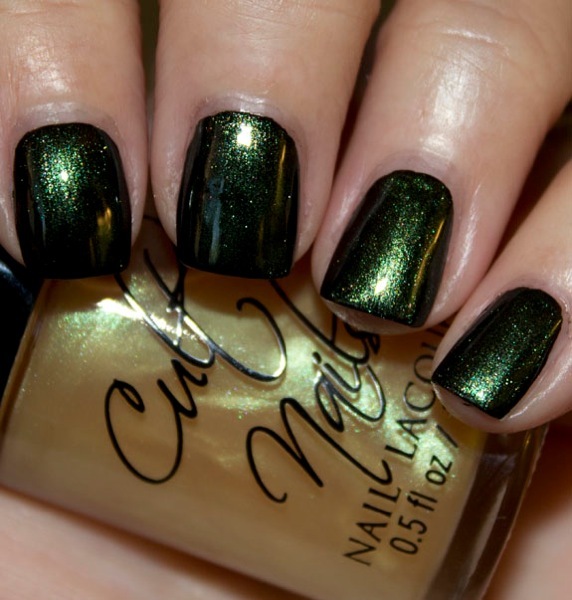 Two Timer creates a vivid emerald green shimmer. Deception creates a really pretty purple and pink look. Charlatan creates an AMAZING uber-shimmery purple/blue/pink look. This is my favorite one because it’s so sparkly. Overall: Love these! 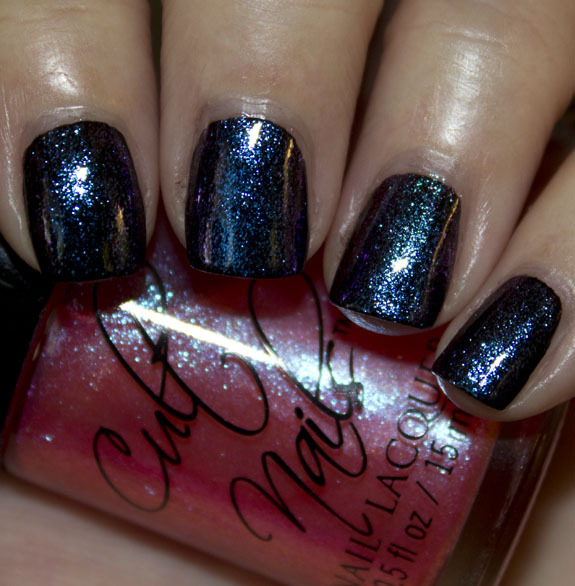 I think top coats like this are really great because you can use them in more than just one way. The layering possibilities are endless, so you get more bang for your buck than just another regular shimmery shade. My favorites are Charlatan, Doppleganger and Alter Ego. Pricing: $10.00 for 0.5 oz. Have you tried any of these top coats yet? Which are your favorite ones? Alter Ego is my favorite, although all are pretty! OMG how can anyone pick a favorite! They are all so gorgeous! I missed the pre-order on this and then also missed the discount earlier this mo…darn it…life is busy. but I keep seeing these and need them. I am really drawn to these kind of toppers. Oh I just love Cult nails! I would buy them all if I could. Beautiful! I want them all! Would be fun to stack on one another lol. This is so funny! I was just writing a post about layering and how I have many “layering” polishes I do not use… and you come with these!! I’m starting to love some layering myself! My favourite of the bunch is Charlatan! Look at that! When I saw the first picture I wasn’t impressed, and I was confused because Cult Nails usually have interesting colors. And then I was completely blown away!!! I especially enjoy Alter Ego and Two Timer, but really I like all of them! I love sheer overlay polishes for revitalizing a manicure. I don’t own any Cult Nails yet either. . . These are so cool! You could get basically a million looks out of these. I love these – might be time to place my first Cult Nails order 🙂 I think Alter Ego is my favorite. Gorgeous! Kudos to you for keeping your cuticles clean while painting them black that many times!! I am too lazy to work with layers. Some look impressive but I’ll pass. 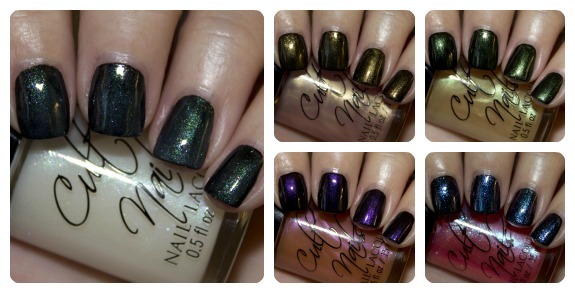 I love these topcoats…I have Alter Ego, Charlatan, and Doppelganger. I put Charlatan over a greige and it looked amazing as well…. These are cool! I wonder what they look like with a different color base!